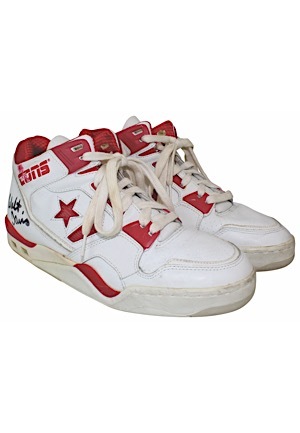 Converse manufactured “CONS” size “12.5” white sneakers with red trim. Walt Davis signed on the outside ankle of both sneakers in black marker and in our opinion the signatures rate a combined 8.5. These sneakers are properly tagged, were presented to us as game-used and show wear. Accompanied by a LOA from JSA.